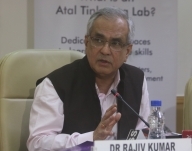 That’s also the view of the Vice Chairman of Niti Aayog, Rajiv Kumar. Several senior ministers have demanded that petroleum products — basically petrol and diesel — be brought under the new taxation regime. According to him, the Central government collects Rs 2.5 lakh crore as tax on oil while almost Rs 2 lakh crore is collected by the states. “From where will they compensate it?” he asks adding that if the taxes are reduced gradually, the burden on the economy will get reduced. Ever since the new tax legislation was rolled out on July 1 last year, there had been the talk of bringing it under the GST with top government officials and ministers supporting the need for such a move. The Opposition parties, of course, have been clamoring for it. In December last year, Finance Minister Arun Jaitley had told the Rajya Sabha that the Central government was in favor of bringing petroleum products under the ambit of GST after building a consensus with states. From Road Transport and Highways Minister Nitin Gadkari to Petroleum and Naural Gas Minister Dharmendra Pradhan, almost every senior BJP minister has favored bringing petroleum products under the GST. “I am just simply saying that let’s not trying to hurry it because you would only run into problems as there is a huge dependence on oil,” he said.